Patacones (or tostones) have become super popular in the US over the last few years. Today I will tell you all the trick to get the crunchiest and tastiest Venezuelan patacones. 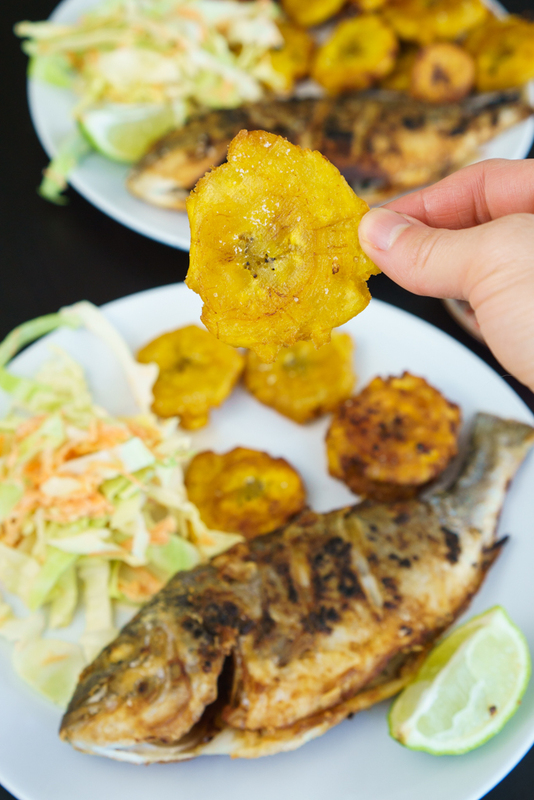 In Venezuela, patacones / tostones are a regular part of our every day gastronomy. Also, they are common in Cuba, Ecuador, Haití, Honduras, Nicaragua, Costa Rica, Panamá, Puerto Rico, República Dominicana, and Colombia. You can tell that patacones are very popular in South America. We just love plantains. This recipe comes from our African ancestors. I only discovered this when I moved to Europe. Then I realize that I could only find plantain in specific supermarkets where the majority of the customer were Africans. Then I researched a little bit more and I found out that plantains were basically only consumed in Africa and then exported to South America back in the day. How to get perfect patacones? Patacones are basically fried green plantains. But the technique of frying and seasoning them is what makes them memorable. The seasoning is just sea salt (or kosher salt) and fresh minced garlic. This will add all the flavor that these patacones need. Then, when it comes to how to fry them you will need to fry the patacones twice to get the desired finish. First, you need to peel and cut the plantains into 1 inch thick slices. Then fry them until all the sides are golden. Then, with the help of a tortilla maker —a flat plate also works— crush the plantains to give them their signature look. During this process, season the plantains. You can see in the pictures that I use a table that I cover with sea salt and the minced garlic. I crush the plantains over this mix so they impregnate with the seasoning. Finally, you need to fry the patacones one more time for a couple minutes and that’s it: the crunchiest patacones! What you can serve along with patacones? In Venezuela, patacones are served usually with fried fish and coleslaw, just like in my pictures. But you can easily use them with ceviche, milanesa de pollo or pollo a la plancha. The simplest way to serve them is with some Venezuelan grated white cheese. Patacones have become super popular in the US over the last few years. Today I will tell you all the trick to get the crunchiest and tastiest Venezuelan patacones. Peel the plantains and cut it into 1 inch wide pieces. In a medium size pan, add enough oil to cover the plantains. Fry over medium heat until all the sides are golden. Season the fry plantains with the salt and the minced garlic. Crush them with the help of a flat plate. Fry them again for a couple of minutes until they are slightly brown and crunchy.